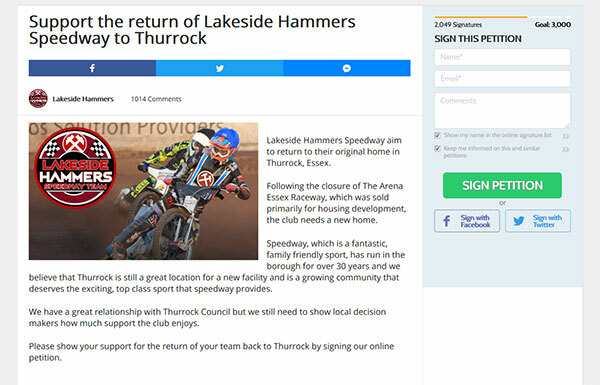 The Lakeside Hammers iPetition, launched last Wednesday, has now passed over 2000 signatures. The petition, part of a campaign to show support for the Hammers, and their aim to return to Thurrock, has been signed by Hammers stars such as former Skipper Davey Watt, Jonas and Daniel Davidsson, Piotr Swiderski, Kim Nilsson and Ben Morley along with many local fans from within the borough and speedway fans from across the country and world. The petition also includes over 1,000 comments, all of which are personal messages showing just how much the return of the Hammers and the sport to Essex means to people. In addition, fans can also send a written letter showing their support for the Hammers to the Head of Planning and Regeneration at Thurrock Council – a draft letter to download can be found in the campaign section of the site here.